While many of us think that not eating is the way to diet, most experts will tell you that continuing to fuel your body in healthy ways will help your body lose weight faster than sending it into starvation mode. One of the key parts of this theory is snacking smartly. Protein will help keep you fuller longer and will help keep you away from that vending machine when your energy starts to fall. That’s why it is recommended that most women aim for around 46 grams of protein per day. Here are five delicious and portable high-protein snacks you can take anywhere. 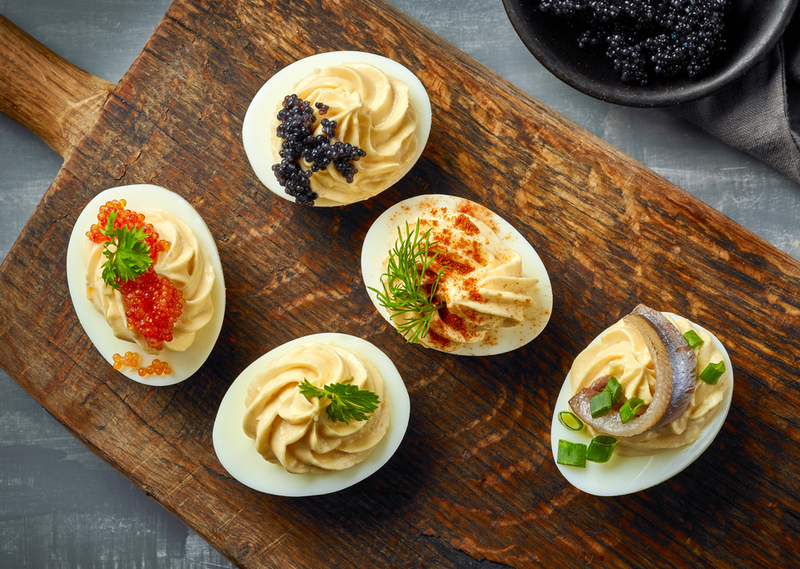 Hard-boiled eggs usually contain about 6 grams of protein. Including fiber in your snacks also helps the entire digestive system. Filling one cup’s worth of celery stalks with 2 tablespoons of natural nut butter will yield you about 6 grams of protein. If you prefer to have drink your energy boost, try a protein shake. You can skip the protein powder by combining 1 tablespoon of peanut butter and 1 cup of ice with 1 medium banana and 1 cup of low fat chocolate milk for a delicious treat with you about 15 grams of protein. I’m a huge fan of dips and anything that could be considered a vehicle for them. For a healthy alternative to onion dip and potato chips, enjoy veggies and hummus. A third of a cup of hummus with half a cup of sliced vegetables will give you almost 7 grams of protein. If you like a variety of textures in your snack, make your own mini cheese plate. You can get almost 10 grams of protein from the combination of one 2% string cheese, 3 whole-wheat crackers, and 10 almonds. This entry was posted in Diet, Lifestyle and tagged Beauty Frizz, BeautyFrizz, diet, diet-friendly, eggs, fiber, health, health and fitness, Healthy, healthy alternatives, high protein, lifestyle, lose weight, protein, protein powder, protein shake, recommended portions, snacks, weight, weight maintenance, weight management.